Every year Pantone releases the "color of the year" based on trends in fashion, travel, and art. We always eagerly await the announcement, and couldn't be more in love with 2019's color of the year - LIVING CORAL. Pantone describes the color as "an animating and life-affirming coral hue with a golden undertone that energizes and enlivens with a softer edge." This romantic hue is perfect for weddings. 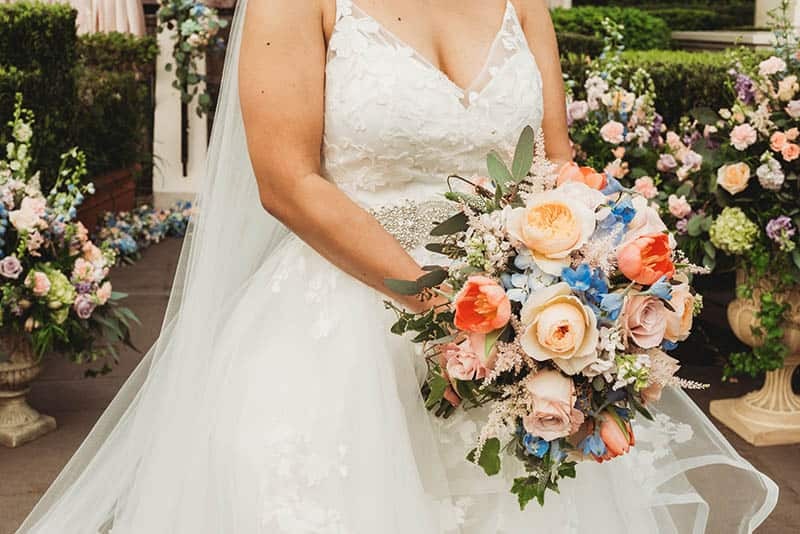 From pops of coral in floral arrangements, to bridesmaids dresses or even incorporating the color in food - there are so many fantastic ways you can include Pantone's color of the year throughout your Disney Wedding. In fact, many of our Disney Wedding couples have already included this stunning hue throughout their wedding celebrations. We've pulled together some of our favorite photos for inspiration for your special day! One of the best ways to include the Pantone color of the year is throughout your floral. From pops of color in your bridal bouquet, to tablescapes, and floral arches. Coral is a fantastic accent color and makes a bold statement.